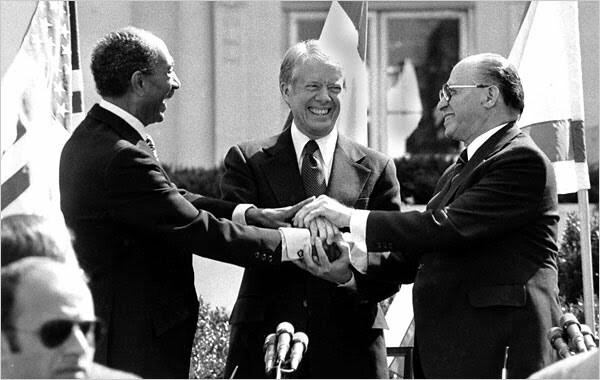 From a New York Times review of Carter's book We Can Have Peace in the Holy Land. OK, I'll admit it - of the U.S. Presidents of my lifetime, Jimmy Carter is my favorite so far. (Depending on how things go, Barack Obama may change that...) It's not that Carter was the most effective, or the "greatest" in any historical sense, but rather my personal favorite, in terms of who he was, his vision for the country, and how he lived his life. If he had been able to pass his original energy bill, we'd now be much further down the road toward a renewable energy economy. If you want details of Carter's life, you should start with the Jimmy Carter Library and go from there. This is just a collection of my own personal Carter favorites. Then Georgia Governor Jimmy Carter's Law Day address at the University of Georgia, May 4, 1974. The infamous "killer rabbit" affair.